Telling a complete story about the entire Phase I of Africa RISING program in one blog post is a challenging task. But if you are looking for the tell-all of the program’s first phase, please take a look at the recently published report Footprints of Africa RISING—Phase I: 2011–2016. 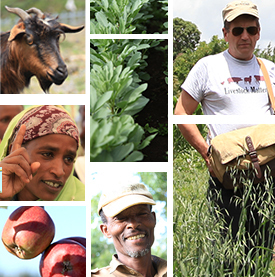 As you can imagine, this multi-partnership, multi-year, farming systems research-in-development program has several moving pieces – each presenting separate, but synergistic and coordinated efforts on sustainable intensification of smallholder farm households in different communities and countries. Through the voices of seven Africa RISING implementing partners from Ethiopia, Ghana, Malawi, Mali, Tanzania and Zambia; we get insights about what it took to implement Africa RISING phase I in different contexts and countries, what the first phase of the program gave to the farmers and global knowledge community (outputs), and some of the partner’s proudest achievements from working in the project over the years. These insights make for an interesting reading together with the Footprints of Africa RISING—Phase I: 2011–2016 report. Ahmed Umer (photo credit: ILRI/Simret Yasabu). 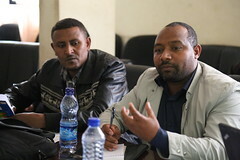 In Ethiopia, different farmer research groups were established; theoretical as well as practical training was delivered at different times for different farmers; farmer field days were organized as a means of knowledge transfer and an experience sharing mechanism; cost benefit analyses were also done for some crops to avoid dependency on wheat; practical as well as theoretical training of trainers was delivered on how to improve diet diversity at household level, especially for women and children. Effort was also put into linking health extension workers, development agents and development partners with the goal of improving household nutritional security. Abdul Rahman Nurudeen (photo credit: IITA/Jonathan Odhong). Africa RISING Phase I in Ghana concentrated on developing and evaluating integrated system technologies together with farmers (especially women) at farm level using the technology park approach. The technology park was a field demonstration centre where farmers learned and practiced different technologies under the guidance of a scientist and an agricultural extension agent. This approach helped direct and indirect Africa RISING beneficiaries to adopt the technologies fully or modify them to suit their system based on their resource endowment and traditional farming knowledge. 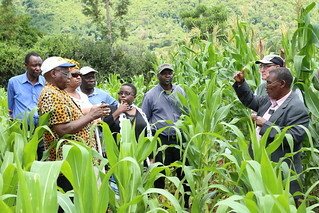 Regis Chikowo explains to farmers why they should not allow Striga to grow on their farms (photo credit: IITA/Jonathan Odhong). Africa RISING had early buy-in from national extension services in Malawi — a key ingredient for scaling up within established systems. While the program had clearly defined ‘intervention’ sites as part of the research design, seeds for scaling that is central to Phase II where already sown during Phase I. This was unique as many research programs only superficially involve extension services, that are the more permanent feature in agricultural development and scaling. Working with thousands of experimenting farmers is implied in a number of articles in this document but we can make it more explicit. Using the mother-and-baby trial technology development and adaptation approach, Africa RISING has built capacity of farmers to more critically evaluate technologies and how they fit in their own communities. The concept of best bet/fit was taken to a higher level with rich feedback from farmer action groups. Stephen Lyimo explains a point to the Africa RISING mid-term reviewers (photo credit: IITA/Jonathan Odhong). It is not lost on me how far we have come with some of our farmers to ensure they adopted or adapted some of the improved practices we were introducing in Africa RISING. 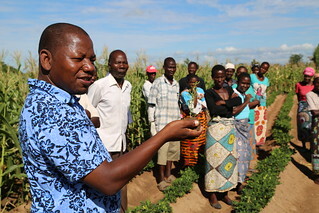 For example, in Babati District of Tanzania, prior to the testing and validation of Africa RISING innovations, majority if not all farmers in the target areas had a belief that inorganic fertilizers destroyed their soils. They also believed that farmyard manure was the only solution to their soil fertility problems and using inorganic fertilizers would not make their soils better! The only way to convince them and challenge this notion was to involve them in the demonstrations we were doing – and it worked! They were able to see that inorganic fertilizers were actually good for their soils and could get them up to three times the yield and income they would get without fertilizer. And supplementing small amounts of farm yard manure with small amounts of inorganic fertilizers increased their yields and incomes significantly compared to the use of big rates of farm yard manure alone, which was not available in their homesteads. Sieg Snapp and Blessing Kadzimbuka (photo credit: IITA/Jonathan Odhong’). Africa RISING phase I has provided novel insights into multiple dimensions of sustainable intensification on smallholder farms, including productivity, profitability and environmental tradeoffs. 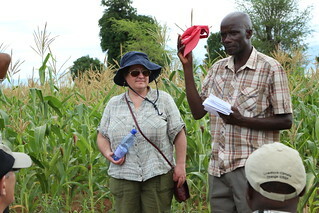 A unique aspect of this multidisciplinary farming systems research project has been the use of participatory action research and extension approaches to explore human and social dimensions of sustainable intensification as well. Gender-aware indicators and best-bet technology suitability mapping are some of the exciting new tools under development to support scaling out in the second phase of Africa RISING, so the best is yet to come. Christian Thierfelder (photo credit: ILRI/Simret Yasabu). 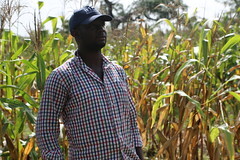 For the agro-ecological environment in eastern Zambia, a farming systems project like Africa RISING has been a blessing because in the past too much emphasis has been placed on commodity research only, disregarding the complex interactions and needs of smallholder farmers. 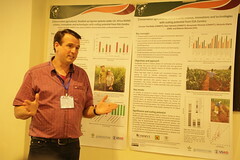 We promoted sustainable intensification in conservation agriculture-based systems including green manure, doubled-up legume systems and other ‘climate-smart’ interventions and provided the necessary research evidence and proof-of-concept for larger scaling projects run by the Catholic Relief Services (CRS), the Community Markets for Conservations (COMACO) and the Total Land Care (TLC). 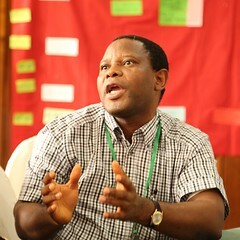 Augustine Ayantunde (photo credit: IITA/Jonathan Odhong’). My proudest achievement with Africa RISING Phase I is the elaboration, development and formalization of local conventions (regulations) for natural resource management in the project communities in southern Mali, which has led to significant reduction in the incidence of conflict between host farmers and transhumant herders who pass through the communities. One of the communities visited by the evaluation team spoke proudly of how the regulations were reducing conflicts, preventing crop losses, improving natural resource management, and contributing to improved livestock management, given that regulations and penalties now apply for untethered animals. 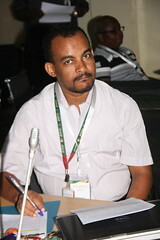 Birhanu Zemadim (photo credit: Africa RISING). My proudest achievement having been involved with Africa RISING Phase I is that in Mali, we have been able to develop participatory, demand-driven solutions that are well appreciated by farmers. Our work on natural resources management will pass to the next generation. In an era of climate variability and change, providing long-term investment solutions to increase agricultural productivity and minimize land degradation through efficient use of land and water management practices is key. Tags: Michigan State University, Phase I, USAID. Bookmark the permalink.